P.B. Winterbottom is one of those games that was lucky enough to get a serious push from the press. Starting as a student project and ascending all the way to XBLA title, it certainly is something of a cinderella story. The real question is, does this unique title stand up to the hype? With P. B. Winterbottom taking his pie grabbing antics to Steam next week, we thought it was time to dig into the specifics and see. The visuals are a large part of the appeal to this game. Overall, the presentation is intended to mimic that of a silent movie, and it does so perfectly. It isn’t so much black and white as muted, with plenty of beige and purple showing up, and eventually more vivid reds and blues. Film flicker and scratches overlay everything from start to finish, giving the feel that you are watching it on an ancient projector. The art style is reminiscent of Penny Arcade’s Twisp and Catsby strips. Character designs are exaggerated caricatures and fit well with the overall tone. Environments have the irregular lines and grimy detail you would expect from something from the early industrial age. It is a very consistent presentation, which means if you are a fan of silent films or the recent surge in popularity of steam punk, you are probably going to eat this up. If you don’t like that stuff, the style doesn’t get in the way of the gameplay, so read on. Like many indie titles, this is a puzzle game, specifically a puzzle platformer. As such, it has the standard run and jump controls. You can club things with your umbrella and use it to slow your fall, also fairly standard for the unusually common umbrella-bearing protagonist. Levels are beaten by collecting pies. Mysterious, anti-gravity pies… trust me, it works in context. Sometimes the pies need to be activated, others are protected by fire, others are only reachable by being tossed by a switch-activated springboard. Who activates the switch? Well, the other thing that this game has in common with most indie titles is that it is largely defined by a gimmick, in this case time bending. Specifically, you are able to make prerecorded duplicates of yourself. It seems like a simple concept, but the game explores it in every possible permutation. Limited numbers of duplicates, limited locations where duplicates can be made, pies that can only be collected BY duplicates, duplicates that kill you if you touch them. Heck, by the end, you are being assaulted by psychotic, umbrella wielding duplicates that do nothing but run toward you, jump when you do, and bash anything that even looks like you. That bashing, by the way, is of course an integral part of solving puzzles. Dare I say I may have brute-forced a solution to more than one puzzle by just bludgeoning one of my copies until he’d bounced across every pie on the map. At any rate, the constant shifting in play style keeps the game fresh, particularly considering its length. The length, in fact, is really the one weakness of P. B. Winterbottom. Each gimmick gets a story level and a cluster of bonus levels that test you to solve them below a certain number of duplicates and below a certain amount of time. If you really manage to hone your time-slicing mojo, you can easily be through this game in three hours or less. Sure, it doesn’t last long enough to wear out its welcome, but if you are anything like me you ended this game hungry for more. Is that a good thing or bad thing? Well, it all depends on how much free time you have. This being a silent film styled game, the sound is not exactly central to the game. Dialog comes in illustrated story cards. The soundtrack fits, from the standard silent film piano to creepy orchestral music, but if you are playing this for the music you’ve missed some important elements. I hadn’t gone into this game expecting anything special, but frankly, the story is exceptional. There is a magic, dimension-bending pie. It decides it is time to teach our man Winterbottom the error of his ways. Since P.B. has made it his purpose in life to eat pies, you can see why a sentient pie would want to break that habit. What is really clever about the story, though, is that the whole of the game is spent undoing the disasters you cause during the tutorial. A flood, a fire, you name it, all caused by your training and then solved by the machinations of a floating pastry. Each disaster also effects the lives of the same small group of townies, too, so there actually is a fairly strong and continuous narrative. 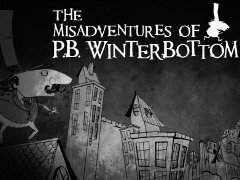 When it all comes down to it, P. B. Winterbottom is the definitive indie game. It is refined, polished, clever, unique, and well-crafted. It has a slick, consistent presentation, and most importantly, it is FUN. Like all good puzzle games it is difficult enough to challenge you, difficult enough to make you feel like a genius for figuring it out, but never too frustrating for too long. 9.5/10: Add a few dozen more puzzles and a few extra levels, and it would have been perfect.